This guide is to analysis what crafting guide to choose for early contents and end game players in Blade and Soul. 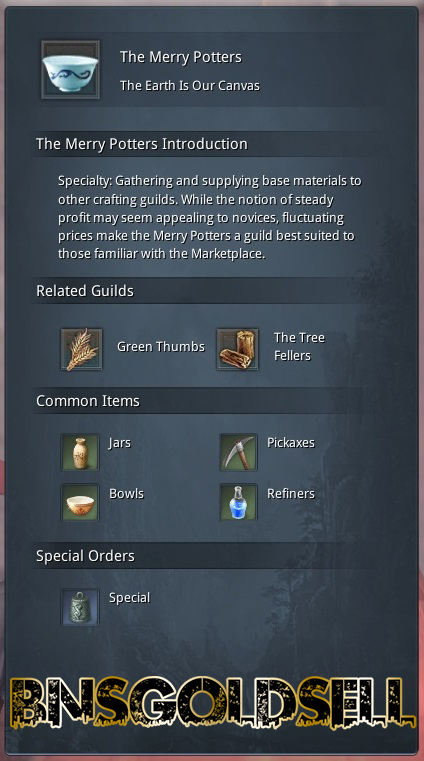 In order to get the materials to craft, you need the accompanying gathering guide when choosing a crafting guide. This guide is for beginners to know what profession to join in their early days. Clan crafting is important as that is where you can get guild outfits and certain items to unlock more of your skill tree. 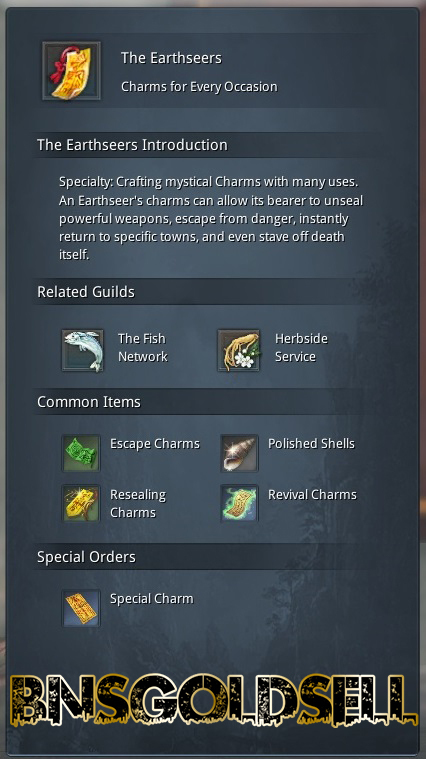 There is a various kind of sub professions in Blade and Soul, 7 gathering guilds and 7 crafting guides. Once you get to Jadestone Village, you can choose your professions. You can only join up to 2 gathering guilds and 2 crafting guilds. As for acquired Taste, it is suggested using combination Soul Wardens and Merry Potters. 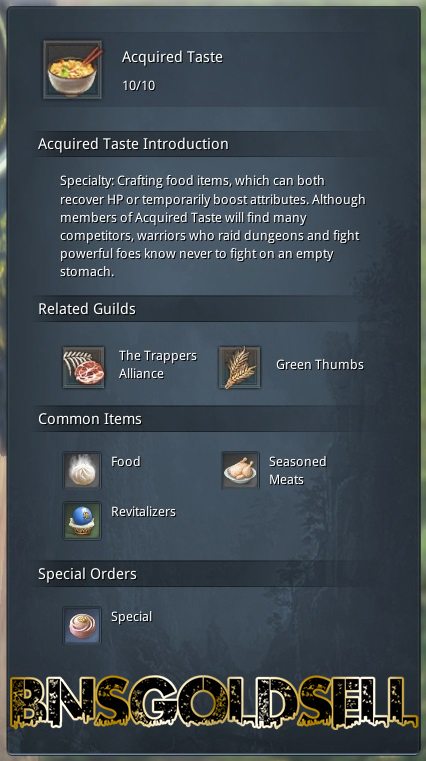 If you want to have some temporary boosts for your stats in early game, you can choose foods. When you reach level 45, you will need Purification Jar to complete the Windstride quest. Only Merry Potters can make it and one of the crafting material is from acquired taste proession - Ceremonial Meal which need to have Acquired Taste secret technique to get it. You can make and sell Ceremonial Meal to earn Blade and Soul gold. It takes 4 hours to make it and the secret techniques has a low drop rate. Once in a blue moon for end game PVE players, buff food may be useful when you are really desperate for that extra few points of DPS to kill the boss in time. Buff food can be dropped from mobs everywhere or given during events. To get Merry Potters, it suggested combination of Acquired Taste and Soul Wardens. You can craft bowls and refiners as a Merry Potter. In order to craft higher level items, these are must have items. Also, you can craft windstride quest items which can be sold for a very high price on Market Place. To go further in game, you should have done their windstride quests, which meas the demand become lower and ingredients for the higher level items become more expensive. As othe professions need bowls and refiners, it is still good way to make Blade and Soul gold. To get Soul Wardens, it is suggested combination of Acquired Taste and Merry Potters. You can craft transformation stones in early game. To upgrade weapon, they are the must-have items. You need Merry Potters and Sap from Tree Fellers and Quartz from mining to make transformation stones. They are designed to be fused to your main soul shield and can give you additional stats. Crafting is best profession for end game! Withe players arriving in the Moonwater area, the demand for Moonwater Transformatio Stone will increasingly rise. As players get their best end game Soul Shields, they will look for sub soulshields to fuse and this is time to earn Blade and Soul gold. To get Earthseers, it is suggested combination of Silver Cauldron. Four stars are purely for the unsealing talismans which rarely drop from mobs or in dungeon treasure chest. It is not enough to get them from quest. You can crafting Banishing Charm which is necessary to craft Purification Jar. Revival charms may be useful in end game. To get Silver Cauldron, it suggested combination Earthseers. In early game, DEM pots are dropped everywhere. 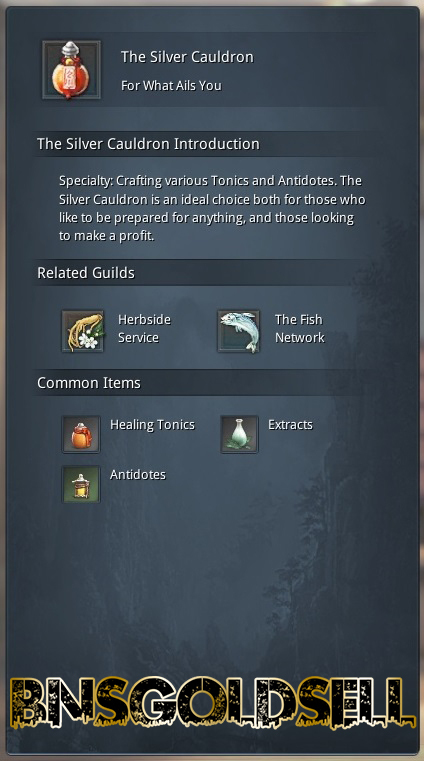 In end game, you are an important profession for some guild craft items. To get Radiant Ring, it is suggested combination Forgekeepers. During early content, players start to experience a shortage of keys from level 20 as you keep opening weapon chests and RNG won’t let you get your character’s class weapon. You can get keys from quests, which is not enough. This sub profession allows you to craft keys easily at a very low cost. 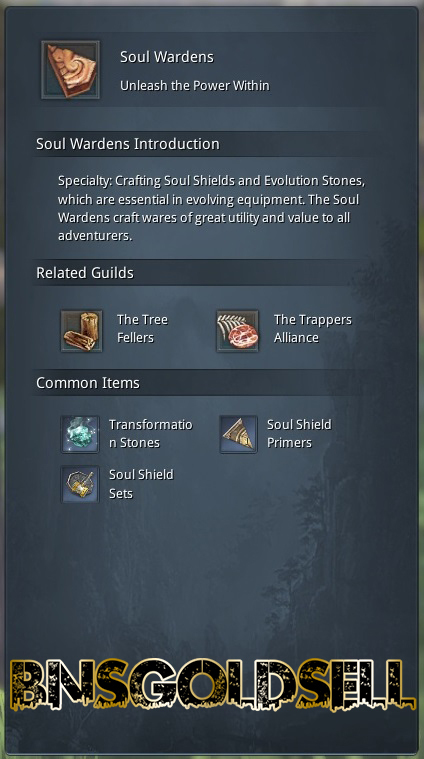 Also, you can sell them to gain some Blade and Soul gold to level up your gear. Besides, you can craft jewelry to feed your main accessories. You will no longer need keys and jewelries in end game. But you will need craft a diamond gem bag which can add permanent stats to your character. The only useful diamond is the one that adds Attack power. Both the gem bag and the diamond it contains can be traded. You can just sell the bag or pray to RNGesus, open it, and see what you get. To get Forgekeepers, it is suggested combination Radiant Ring. 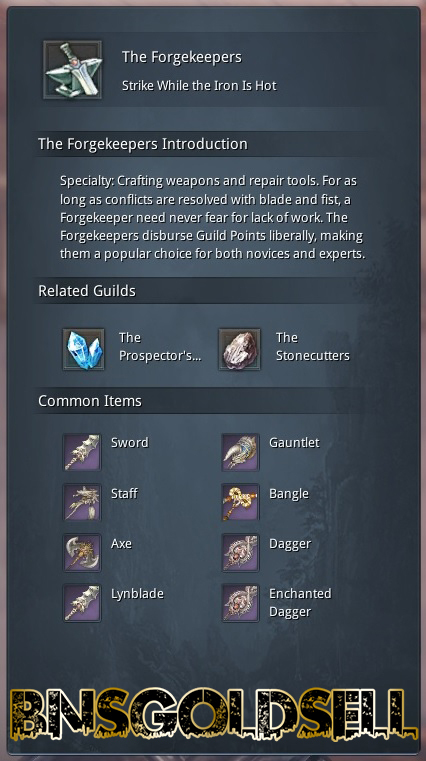 In early content, you can craft repair tools which can be dropped from anywhere. What’s more, your weapon is consistently evolving and its durability always resets to 100%. You can craft weapons to feed your main weapon, but weapons are dropped everywhere also. In end game, high level weapon needs more than one repair tool to repair . Your weapon durability goes away pretty fast. You have a chance to get repair tool in your daily reward box, but it is never enough. You can go to Auction House to buy repair tool with 2 silvers. Keep the repair tools for yourself as you can sell them if you have lots of extra and earn Blade and Soul gold.